Your profile picture and headline are two of the most important and most viewed elements of your profile. As LinkedIn as a professional social network, your profile picture should reflect the professional that you are. Instead of ‘unemployed at N/A’, consider updating your headline to give a short overview of your background relevant to the type of position you are seeking. 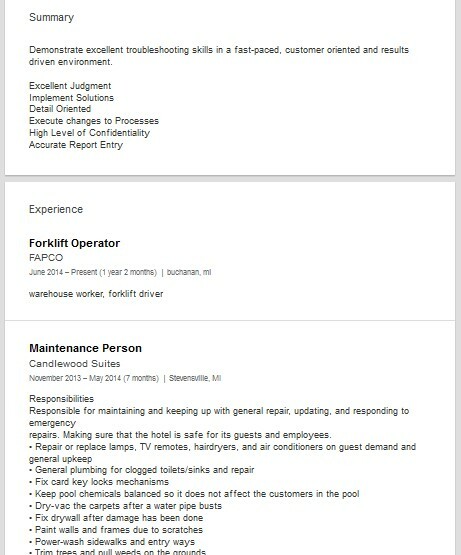 One example includes ‘Navy Veteran Seeking Maintenance Position’. LinkedIn allows space for up to 50 skills to be listed in your skills section. Make sure that the skills listed on your profile are related to your background and abilities. Skills most related to the types of positions you are seeking should be at the top of the list. You currently have 19 connections. Adding connections, including friends, family, and former co-workers will increase your chances of your profile being viewed by companies that would be interested in hiring you. You might be also interested in our health services administrator Linkedin profile review. The maintenance staff plays a major role in any organization to handle many important tasks i.e. fixing electricity issues etc. All the related and even other skills (you have) must be added to appeal the recruiters. Wwithte in perfect English grammar to impress the employer straight after reviewing your profile. There is no room for making any spelling mistakes. Read your info repeatedly to spot such mistakes. Write about all major duties i.e. responding to emergency, updating, keeping up with general repair etc. The work experience along with names of employers should be added. Never forget to add the dates of years when you left each job. Mentioning the phrase jobless, looking for a suitable employment or related words can be beneficial for you. If you already have a good job, your attractive profile can help in landing excellent work opportunity. It is suggested to write in your own words. The employers can easily judge candidates during an interview session. It is better to skip the sentence rather than using inappropriate or meaningless phrases. 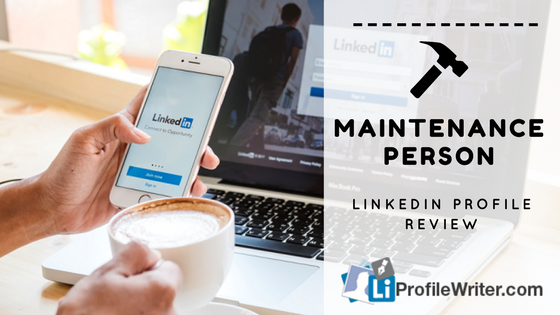 If you’re facing challenges in creating ideal LinkedIn profile despite having years of work experience as a maintenance person, you should rely on expert’s suggestions. Never mention the names of firms where you dream of working anytime in the future. This definitely makes other employees feel not well. The irrelevant info can easily spoil your image in front of the recruiters. The concise and to-the-point overview along with a good title of a profile is important and highly suggested. The career as maintenance person has bright future for any individual. This is because of their consistent requirement in all the corporations. You are required to write 50 skills in LinkedIn Profile. However, more than 50% professionals in all over the world don’t fill up all 50 fields to write the skills. However, it is not compulsory either you’ve 10 or 50 skills. All should be based on true info indeed. It is better to rearrange the sequence of your recent work experience similar to media. Try to show most relevant experience on top by just clicking and dragging each positioning block. The thing that could cost you credibility and makes one look less professional is having out of date experience. It should be the first step of reviewing. The next step is related to check links of your website. Under the Contact section on your profile, go to websites to check the links. Then, click on the Edit icon in case of adding links or change them. Customize the text by choosing other indeed. This is an important step that shouldn’t be missed without any doubt. Our team of experts has been in the business of building online profiles for years now. We have worked with rank file employees to managerial positions in different hiring companies. We keep our clients on top of our priority. We make sure that you get a call for an interview and job offer eventually. Our experts create a profile for you to make you look good on your online resume. This is what companies will be looking at when they see your application. We ensure that your skills, achievements, and experiences are well highlighted on your profile. 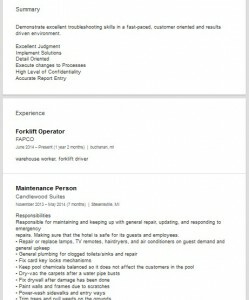 We use keywords that companies are looking for on this specific position. We also bring out the best professional experience you had and ways it makes you the best applicant for the position you are applying for. We tailor your experience based on the job description that companies are looking for. We use only the most important details to promote your profile. We focus on the best skills you have and align them to the job position.